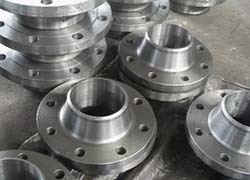 Welding Flanges, Welding Flanges Manufacturers & Exporters, Welding Flanges Suppliers. We Royal Steel India, are one of the leading Manufacturer, Exporter & Supplier of Welding Flanges. Our offered Welding Flanges are widely applicable in petrochemical and heavy engineering industries. These flanges are designed using high grade material sourced from trusted dealers across the country under the supervision of the team of experts and are highly acclaimed by the clients for its durability and long life. The valued clients are served at industry leading prices.